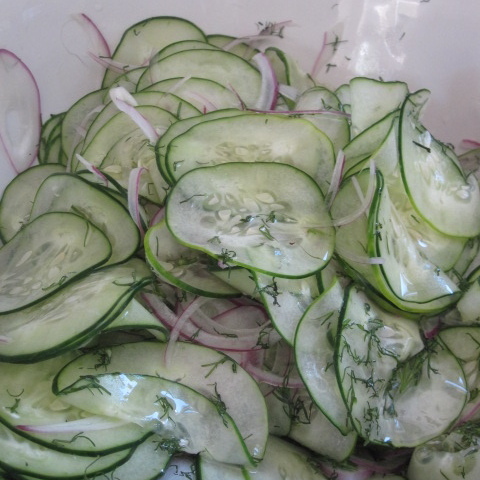 Solstice, summer and dilled cucumber pickles. If you’re a glass half empty kind of person you’re may be kind of miserable right now. 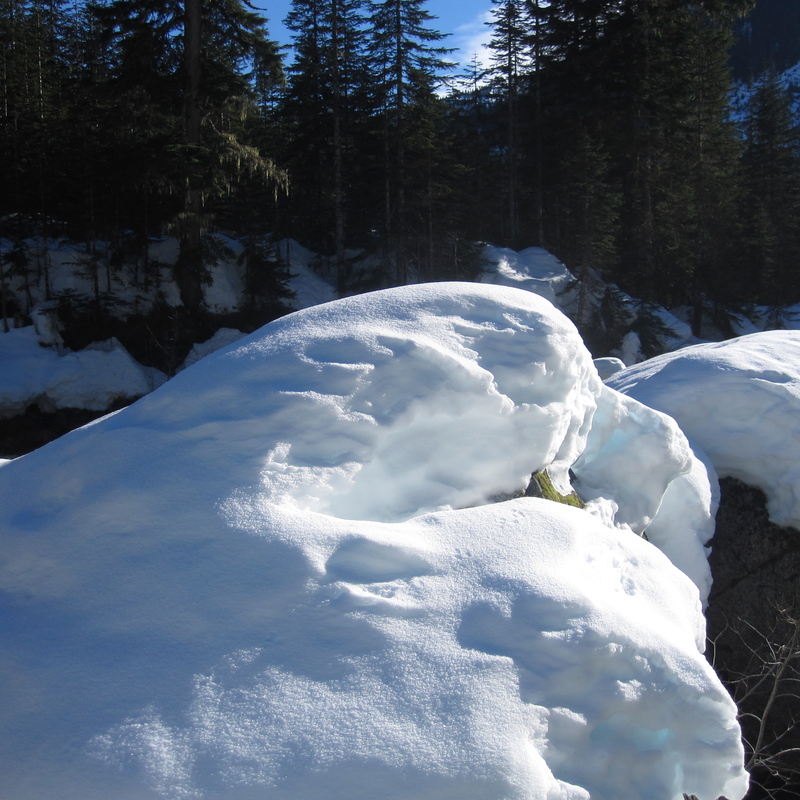 After all, the longest day of the year has come and gone and we are already in the slow slide to winter (perish the thought!). I try to be a glass at least a quarter full person most of the time so after a mini-moan about how we haven’t even really had summer yet this year I tried to get in the spirit and celebrate. Not so surprisingly I did it with a meal. Summer solstice, or Midsummer, celebrations throughout the world take many forms. They often involve the celebration of fire and water and are thought to be primarily pagan in origin. In the Swedish culture it is believed that magic is strongest on the summer solstice and that it is the best time to perform rituals that see into the future. Now I don’t know if it’s because I spent time in Sweden as a baby or if it’s because summer is my favourite season, but every June I make an effort to do something to rejoice the longest day of the year. This year I didn’t get all fancy, I lit some candles (a bonfire seemed a bit extreme) and I made a simple Swedish inspired dinner. On the menu were buckwheat blini’s topped with smoked salmon (I forgot to buy herring) sour cream and dill, boiled new potatoes and a quick cucumber pickle salad. 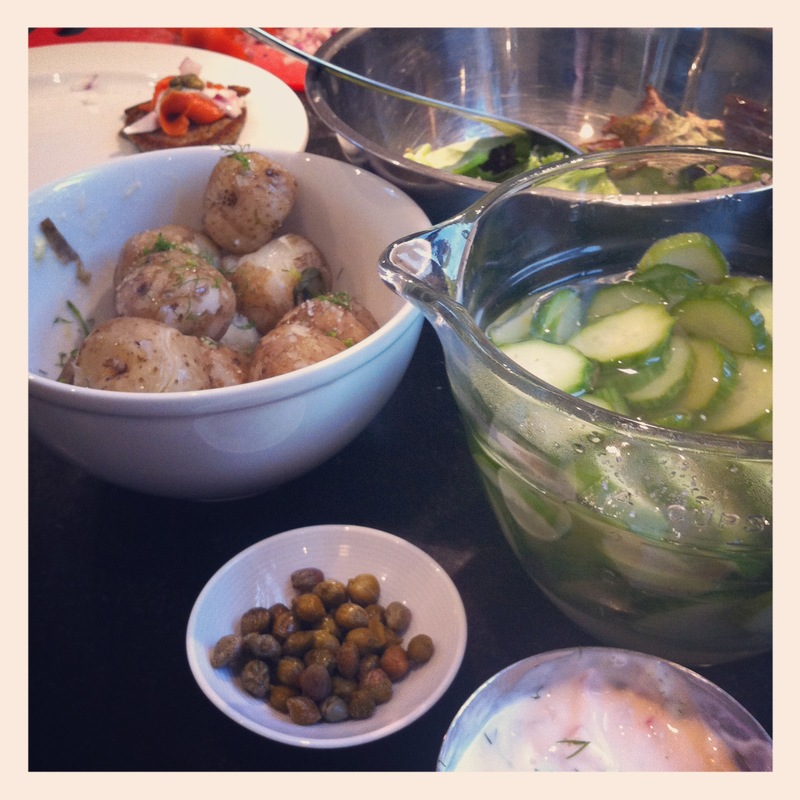 Growing up my mother always used to make a cucumber salad with vinegar. (She also made a great one with sour cream – but that’s another post). It is hard for me to picture a summer meal that didn’t have a bowl of those cucumbers on the table. Over the years I’ve played with the recipe. I’ve varied the types of vinegar, sweeteners and spices and added different types of onions depending on the meal I’m serving it with. My basic recipe however doesn’t change. I like to think it’s one small way of always having family at the table to toast in solstice. Something that solstice magic didn’t fortell is that this year I would discover yet a new way to eat the pickles. For breakfast. By the next day the cucumbers had, predictably, become even more pickled and as someone who is not a big fan of breakfast food (but for some reason was craving pancakes) I was able to create the most lovely summer morning meal. Leftover buckwheat blini piled with fresh avocado, cucumber pickles and salmon. 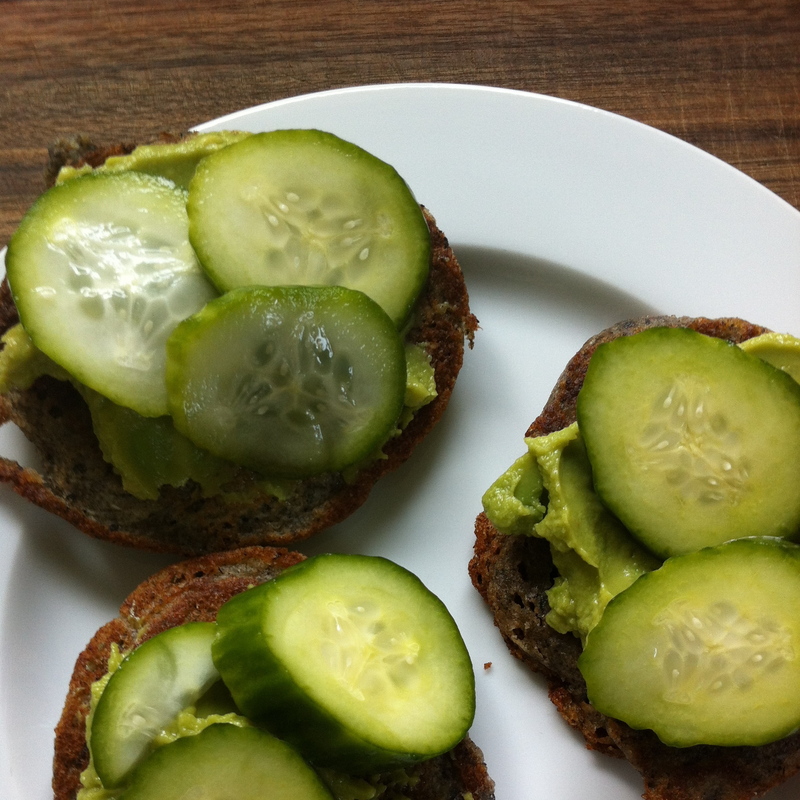 So whether for breakfast, lunch or dinner here’s my super quick cucumber pickle recipe. Thinly slice cucumbers on the diagonal. A mandolin makes quick and easy work of this. In a bowl mix the water, sugar,vinegar, dill and salt. Mix until sugar and salt have dissolved. Add cucumbers to the bowl. Cover and let chill in the refrigerator for a minimum of an hour. Taste test and if necessary add more vinegar or salt for some extra pucker. This entry was posted in Breakfast, Cooking, Food, Herbs, Lunch, Recipe, Salad and tagged blini, buckwheat, cucumber, dill, salmon, sea salt, Solstice, vinegar by mostlynoodles. Bookmark the permalink. Sounds perfectly summery – and super simple. Will be trying this very soon. Nice post Megan, fun hanging with you at BlogHer!